The 1975 McLaren M23 was a further development of the 1974 car, with some significant changes to front suspension (incorporating fabricated upper rockers) and bodywork changes (sidepod extensions and shorter nosecone) and a new race number, ie ‘1’, celebrating the reigning World Champion. However, pace of development and internal politics between Emerson and the management meant that the combination of a fantastic new Ferrari (312T) and a hungry Niki Lauda were clearly superior. 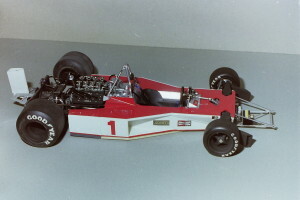 Added to which, it seemed that Emerson increasingly lacked some of his commitment, though he managed to win two Grands Prix, with team mate Jochen Mass winning once, Emerson being runner-up in the Drivers’ title in McLaren’s third season with the M23. 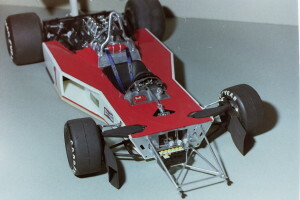 There are only a small number of images of this model, built in 1989 and these exist as prints. 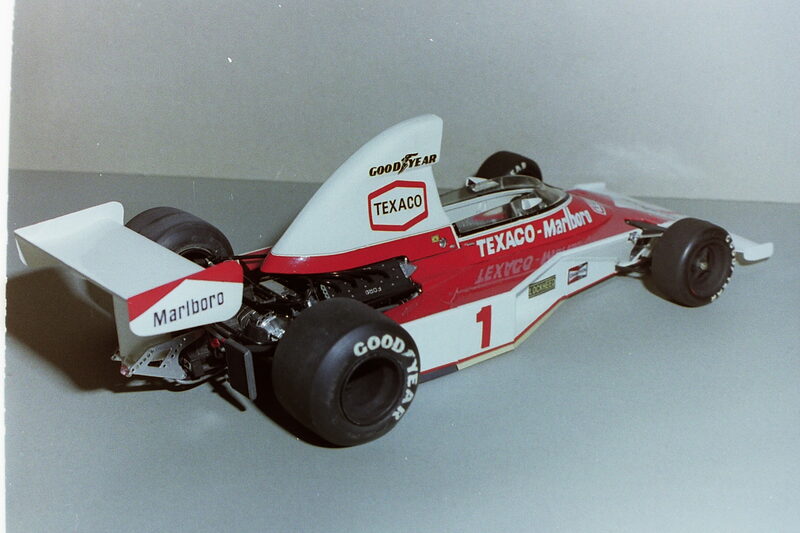 Any available negatives and prints have now been scanned and also appear on pages 58-61 of my Photobox production ‘MRO F1 Engineering Volume 2: McLaren M23, (1974 and 1976)’ – to view, check out the interactive menu bar on the home page. 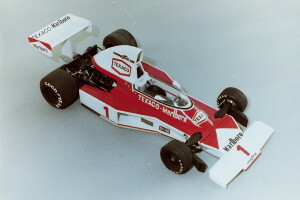 This model was a conversion from a 1974 Yardley McLaren (obvious conversion thought possible due to the high airbox configuration), the original Yardley car being built and hand brush-painted in 1981. As I recall, it was in 1989, that I decided to re-paint the bodywork with a rather primitive Humbrol air brush connected to a ‘can of air’. I used Humbrol 193 Gloss Blaze and this mimicking Dayglo orange and thought it looked marvellous. I hand cut the race numbers and with this variation, my small collection of Formula One models in 1/12 started to look a little extra special – where did you get that one from? 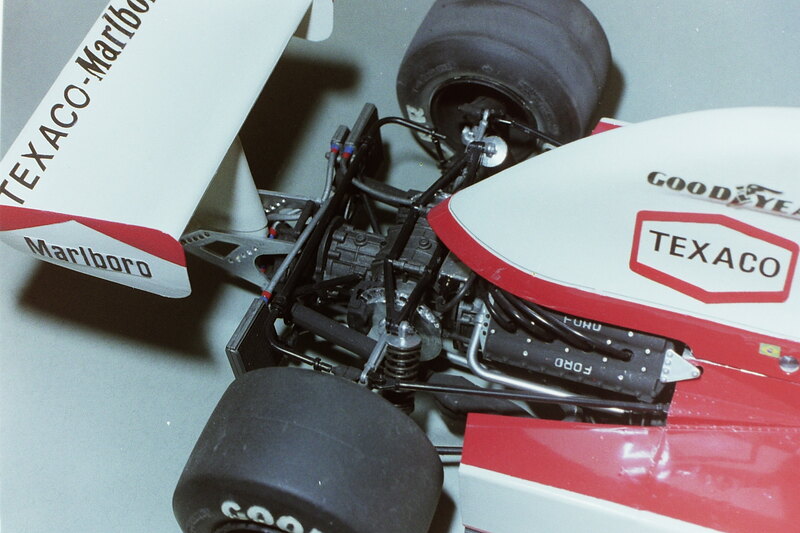 The model was enhanced by addition of vestigial V-section skirts on the undertray, splitting the air after entering under the nose cone. Also, I added modified wingmirrors, seat belts, battery cables, brake lines and the car looked fantastic with the new paintwork and decals. I remained happy with it for some time, even after I realised I had painted it in the wrong red; it should have been painted in the same 1974 red, rather than the distinctive 1976 colour. It was in 1998 that I had gone through a further thought process and committed myself to converting this now inappropriately coloured 1975 car into a seriously good new project, the 1976 McLaren M23 James Hunt car. This is thoroughly covered in a PDF associated with the car listed in the gallery and is referred to in the section relating to Past/Present and Future projects (namely Past). 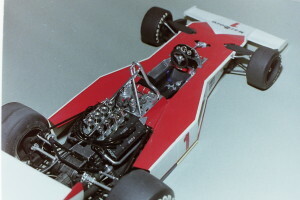 So, the 1975 McLaren M23 model as shown above, no longer exists except that it was used as the basis for the 1976 M23 model and therefore lives-on in that form.